We still attempted to keep our eating out style while Caleb was a baby, and it worked until he was about five months old. He stopped sleeping on-the-go as much and was active and alert. We had to adjust our eating out lifestyle. So, we turned to take-out. I cook all week, so our little treat is to get take-out Friday and/or Saturday. We put Caleb down for bed, and then we enjoy our take-out meal together. Not quite the same, but nothing after kids is the same...right?! A Tacoma classic over in Ruston on the way to Point Defiance. Don't let the bison scare you off, it's really similar tasting to beef and doesn't have a gamey taste at all. My favorite dish to order here is the Bison Melt. It is covered with grilled onions, melted cheese, and a dressing all between two toasted slices of dill rye bread. I love the red skin spuds as my side (frankly, the side salad is mostly lettuce and the potatoes rock. It's not a hard decision here). Whatever you do, order something with bison. It's hard not to as the whole menu is basically bison. HA! And if you're like my family, when you say Tatanka, you have to make little bison horns with your fingers and pretend your Kevin Costner in Dances with Wolves. If you're not sure what the heck I'm talking about, please watch this video. We originally got our take-out from Joy Teriyaki, which is also quite good. However, we switched over to Goofy's as we both ended up liking it a smidge better and I think it was a little cheaper to boot. I'm a crazy orderer; like Sally ordering pie in When Harry Met Sally (I'm not sure why all the movie references, lol). Again, if you're not sure what I'm talking (AGAIN, really, why don't you know my references?!) then please watch this video. Anyway, I get the chicken teriyaki and substitute steamed broccoli for the salad and brown rice instead of white rice. You have to pay a little extra for the broccoli and brown rice, but I prefer it this way. Plus, they give you so much I always get two meals out of it. Don't get the all white meat teriyaki. I did that first and soon found the regular to be better. The dark meat is much juicier and not fatty at all. Trust me, I'm picky. My other favorite is the chicken yakisoba. If you're veggie obsessed like me, then never fear as there are veggies in the stirfry. Josh always changes up his order, unlike me, so he can testify to other things being quite good as well. However, we generally get the Asian side of the menu and not the burgers. However, if you have a burger hankering then per Josh, it is decent. This is a hidden little gem of a restaurant. The menu isn't huge, but they do such a great job. My Thai typical go-to Thai food order is Phad See-Ewe, however, here I've discovered that the Phad Kee Mao rocks the house (and, and then I add broccoli because I'm veggie obsessed). That said, I will order the Phad See-Ewe and it's delish as is the Phad Woon Sen for that matter. Seriously, you can't go too wrong here. It's authentic and perfert for take-out. Yes, another Thai restaurant. I have a slight obsession for Thai food (lots of obsessions, apparently). I think it's the fact that I didn't eat it until the end of college and now I'm trying to make up for all those lost years of not having it. Royal Thais is much more like your regular Thai food restaurant, but it's also quite good. There is much more on the menu, so if Loak Toung Thai doesn't have your usual, then I'm sure Royal Thai will have it. Of course, I get my favorites: Phad See-Ewe and Phad Woon Sen (with chicken...always chicken). But, I was daring and ventured outside my comfort zone and ordered #84 Coconut Chicken once. And now I order this on rotation here because it's delicious. And it makes for two meals! I have two favorite Vietnamese dishes: pho (soup) and bún (vermicelli bowls). Pho is just wonderful during the cooler months and when it's piping hot, bún is just the ticket. Bánh Mì sandwiches are also quite delicious, but it just isn't my go-to pick. That said, all three of these are done very well at La Ca Bar. Pho can be hard to take-out since it's a soup and generally served in quite a big bowl, but it's worth it. Just get out a mixing bowl at home since generally it comes packaged up in separate containers. Oh, I want to let you know that we like Pho King as well; however, it is a further drive (for us, at least). Don't go into this one thinking Mexican. It's definitely different and unique, yet so delicious. The most known Salvadorian dish is the pupusa, which is a thick handmade corn flour or rice flour tortilla stuffed with either cheese, meat, or beans. To be honest, the pupusa isn't my favorite, but my hubby loves them. What I love is the Pollo Guisado. Oh my! It's described accurately as a Salvadorean chicken pot roast. So basically stewed chicken with tomatoes and onions. Then it's served alongside the most glorious rice and beans. One thing to note is that El Pulgarcito III is located out in Lakewood, so it's a bit further away. However, it's worth the drive. When we have a hankering for Mexican, we go with Taqueria El Sabor. It delivers some great Mexican flavors. My order is the Pollo Ranchero, which is chicken (surprise, more chicken) in a red sauce with bell peppers and onions. It's not really spicey, so don't worry if spice isn't your thing. Josh changes his order basically every time and I order the same thing...that's our yin and our yang. If we want tacos, burritos, or quesadillas this is our destination. They have a great salad as well that is great for hot days (that's generally when I want a salad). My usual order is a trio of tacos with different fillings, but check out their specials. They can be real winners! 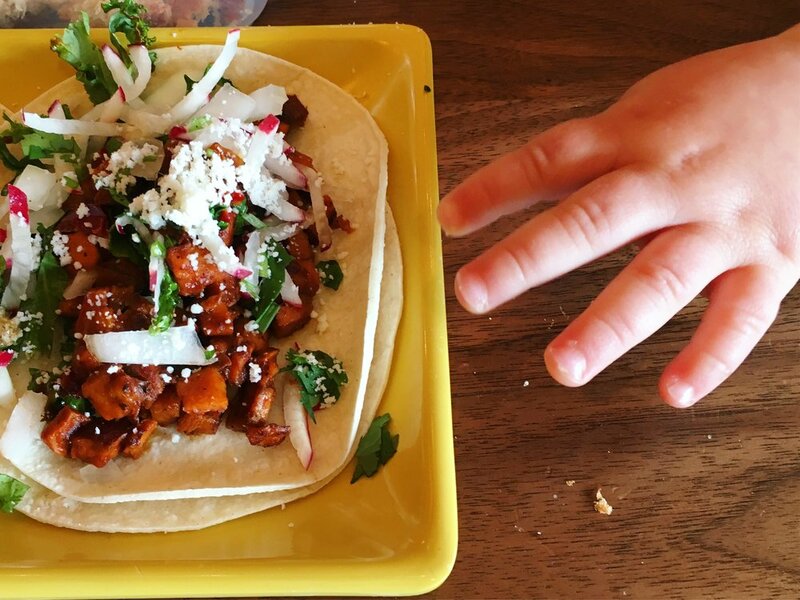 While we do take-out here, we also find it a good option for dining in with a toddler. It's super casual and pretty quick. We often find ourselves here for breakfast since it's not crowded and we enjoy their breakfast tacos and burritos! This place opened recently and it's already making its way into our rotation. I appreciate the fact that it's not garlic overload like some Greek food can be. The hummus is delicious as is the tzatziki sauce. The spanakopita and fried cauliflower are quite yummy. I've been ordering the chicken kabob and it's so juicy. Josh ordered the mansuf last time and it was really tender lamb. I am stoked we have a Geek place to add to the mix. Pizza is such a dilemma for us here in Tacoma. 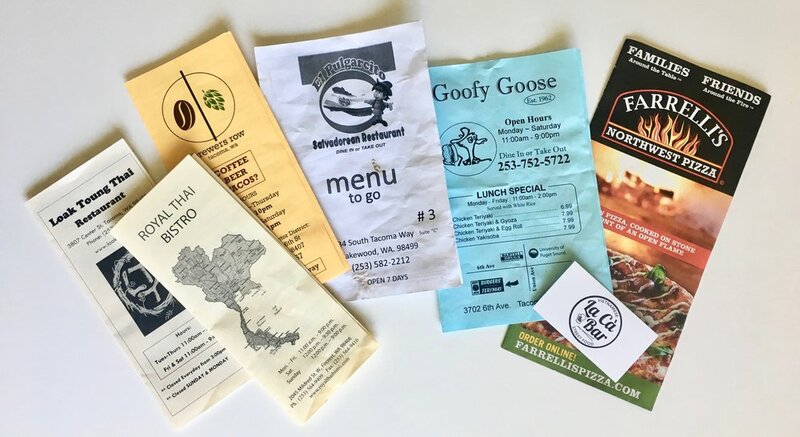 We absolutely love a great pizza but haven't found the "oh my gosh this pizza is the bomb" place (or it's just not here...yet). However, Farelli's does a good job and it's probably our favorite in the area (plus it's close). There are a couple locations, but we find the 6th Avenue shop does the best job and is quicker for pick-up. Of course, we always do a 50/50 split so Josh gets what he wants and I get what I want. Sure, there is MSM Deli, which everyone seems gaga over here in Tacoma. And, yes, it's good. However, I just prefer the fresh feeling I get going to Harbor Greens. Plus, when you pick it up, you can grab a few fruit or cookie samples in the store. The menu is somewhat hidden on the website. To find it, go to "What's Available" in the top navigation bar, then you'll see the Full-Service Deli section in the middle column and a link to the PDF menu. I've enjoyed the Gobbler sandwich or the make your own sandwich option. I'll end this with a tip. If you need a menu, but there isn't a website then try Yelp. Go to the photos section and you'll most likely find a photo of the menu. P.S. Why don't more places deliver in Tacoma?!?! ?